Background: Breastfeeding is an ideal and effective ways to provide and nourish children everywhere with the best start to life. Breastfeeding is also a newborn’s first vaccine, providing vital antibodies, and an immunity boost. Objectives: The objectives of the study were to describe the sociodemographic profile and to determine the breastfeeding practices in the lactating mothers. Materials and Methods: A descriptive study was conducted in community health center, Bellur, for 4 months. An Institutional Ethical Committee clearance was obtained. Around 100 lactating mothers were the study subjects. The inclusion and exclusion criteria of the study were met. The data were collected using pre-tested semi-structured pro forma. Results: The study findings revealed that initiation of breastfeeding within 1 h was practiced among 64% of mothers, on-demand breastfeeding among 54%, and complementary feeding at 6 months was started by 76% subjects. The most commonly used pre-lacteal feed is honey. Conclusion: It was observed that the infant and young child feeding practices were not satisfactory in the study subjects, so focused and sustained information, education and communication campaign is necessary to promote breastfeeding. Knowledge, Attitude, and Practices (KAP) study on HIV / AIDS among HIV patients, care givers and general population in north-eastern part of India. 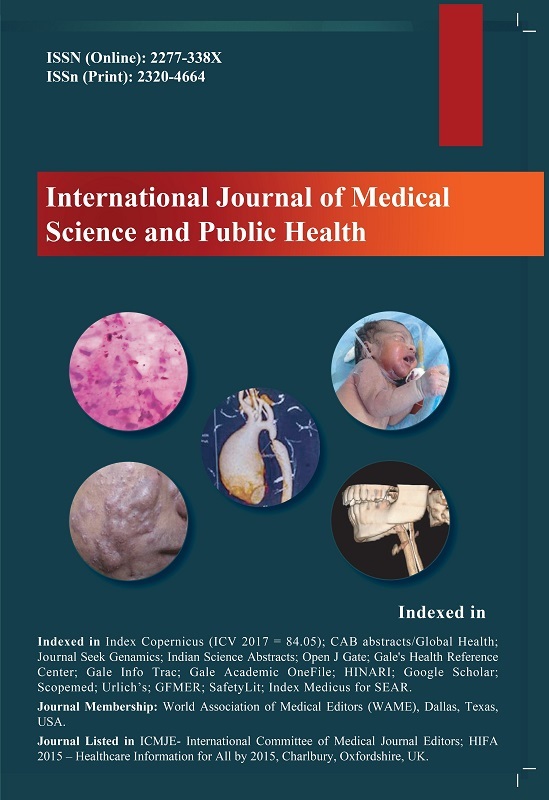 Copyright © 2019 International Journal of Medical Science and Public Health All Rights Reserved. Subject to change without notice from or liability to International Journal of Medical Science and Public Health .